So what are the best bluetooth helmets? I've got that question a lot since I work as a tester and safety is one of the main issues that cheap helmets that come with bluetooth face. The obvious reason to go for a helmet with integrated bluetooth is that you can pick up calls, speak with your riding pal or person on the back and enjoy a new dimension of riding. It's actually a lot of fun! So you'd buy one of this bluetooth-integrated helmets. I want to save you some pain with ugly, bad done helmets and recommend you 7 bluetooth motorcycle helmets that are actually good. Here's the list. If you prefer a super-lightweight balance and feel to your helmet, the TORC T27 Flip up Helmet is the model for you. Additionally, this helmet has integrated bluetooth connectivity for wireless handsfree communication while you ride, keeping you and those around you safer on the road. The outer shell is what provides this helmet with both its toughness and its lower overall weight. It is constructed from a thermoplastic alloy that both looks and feels sturdy while providing superior impact protection. Here’s a short breakdown of the best included features and options for this bantamweight marvel from TORC. The T27’s sizing is based on an intermediate oval fit, but keep in mind that the sizes run big. Be sure to use the sizing chart when choosing your helmet, and if you fall in between sizes, go with the smaller size for the best and safest fit. In terms of stability in heavy winds and while riding at higher speeds, this helmet is rock solid stable. The lining of the helmet is precision laser-cut for superior comfort without chafing or itching, and the fabric is designed to wick moisture away from the skin. In addition to being comfortable against your face for long periods of time, the liner is also removable and machine washable. The scratch-resistant and fog resistant outer clear visor keeps your vision free from distortion even on long rides. To counter the effects of glare and riding into the sun later or earlier in the day, the T27 features a drop down sunshade visor to make sure you have maximum visibility in all lighting conditions. The sun visor is also not spring loaded for safety, and the mechanism functions smoothly to help prevent any balance issues if you need to slide it into place while riding. 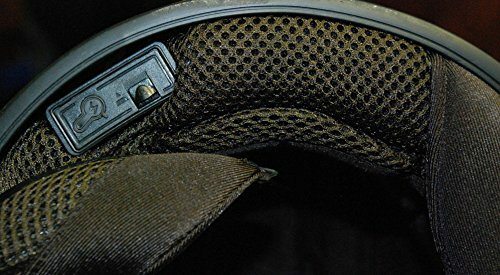 Best of all, the outer visor’s control mechanism is spring loaded and locks in both the open and closed positions according to your personal preference. In terms of versatility, this helmet can connect to numerous devices seamlessly thanks to its Blinc Bluetooth﻿﻿﻿﻿ technology. It can function as a direct intercom with other riders nearby, a bluetooth headset with onboard controls for your smartphone or onboard navigation devices, and streams music directly to your helmet without the need for wires. The bluetooth unit hides perfectly between the padding and the shell as shown in the picture. Customer feedback for using the bluetooth audio features at speeds over 60 MPH also state that the audio is more than loud enough to be heard over motor and road noise even at moderate volume settings. This helmet has chin and top vents for full airflow, and rear exhaust vents help pull warm air inside the helmet out and behind you so it never gets too warm inside. Regarding safety, this helmet meets or exceeds ECE and DOT approval in every category. No chin curtain or antifog nose guard. The heavyweight of TORC’s product line, the T14B Mako is definitely a solid investment literally and figuratively. For the safety conscious, there are few helmets that can rival the Mako as it was specifically designed for superior impact absorption and shatter resistance. If you bail while riding in one of these helmets, you can rest assured that it will stay in one piece and keep your skull and brain well protected. Here’s a breakdown of the features and options of this heavy duty, high impact resistance helmet. Like many TORC helmets, the liners run big on this model, so if your measurements fall in between sizes, go with the smaller size for the best fit. The liner is moisture wicking, breathes beautifully even after long periods of time, and is completely removable and machine washable. The exterior visor is scratch and fog resistant, and and the internal sun visor features a drop-down mechanism that is not spring loaded and operates smoothly for easy adjustment while riding. With wireless connectivity and battery pack integrated into the shell of the helmet, Bluetooth connections to your onboard devices or smartphone have never been easier. Whether you are directly connecting via Bluetooth with other riders helmet to helmet, making or receiving calls, or streaming audio for navigation directions or music from your mobile device or onboard audio/navigation system, the Mako has you covered. Users state that the audio is also quite loud even at speeds in excess of 60 MPH. Best of all, the external controls are large enough to be operated easily even if you are wearing gloves, making adjustment to volume or changing tracks on the go a breeze. Dual visors: clear external visor and internal drop-down sun visor. Helmet is one of the heaviest on the market at 5 lbs. When it comes to superior helmet construction and high-quality features, O’Neal has a sterling reputation for designing and building the best. The Commander model continues their longstanding tradition of top quality helmets with only the best materials and options available. This smart looking helmet has a durable injection-molded polycarbonate shell for superior impact protection, Bluetooth connectivity for helmet-to-helmet intercom, and a whole host of other attractive stylish and functional features. Let’s take a look at everything the Commander has to offer. As far as what you want in an interior goes, having a machine washable liner should be topping your list. Fortunately, the Commander’s microfiber suede liner is fully removable and machine washable. Sizing runs small, so you may want to consider going with a larger size if your measurements are between their sizes. Some users complain that their fit was a bit tight going with a smaller size. The Commander sports a dual visor system with a clear scratch and fog resistant exterior visor and a drop down internal sun visor that can be adjusted easily even while riding. Additionally, the external visor is spring loaded for lock-open and lock-closed one-handed operation. Not having to stop while riding to put on sunglasses or adjust your visors while wearing a helmet is a definite advantage over many other helmets on the market. Where the Commander truly shines is its Bluetooth connectivity features. It sports Bluetooth 2.0 protocol module with an internal, fully replaceable and rechargeable lithium Ion battery pack that provides up to 10 hours of talktime or audio streaming and 130 hours of standby time between charges. The internal speakers provide more than adequate volume and sound quality even when you are riding at higher speeds, and the large external controls are easy to operate even when you are wearing gloves. Best of all, this helmet connects quickly and easily to onboard navigation and audio systems, smartphones, and any other onboard bluetooth capable systems you may have installed on your ride. The Commander even features Bluetooth direct helmet to helmet intercom capabilities at ranges up to 120 feet. The feature I like best about this helmet that you don’t see with enough motorcycle helmets is adjustable ventilation. Sometimes when riding in cooler weather or in the rain you want the option to close up vents to keep stay a little warmer or a little dryer. The Commander comes standard with this feature, and also has exterior aerodynamic spoilers to help make your ride more comfortable as well even in high winds. Best of all, this helmet meets or exceeds all DOT and ECE safety regulations, making it an ideal choice for both safety and features. Best known for their modular helmet design that allows the entire faceguard to flip upwards, Hawk designs some of the best and most unique motorcycle helmets currently available today. The H-66 is one of their mainstay offerings, adding Bluetooth connectivity and high quality construction. The distinct advantage of a modular helmet is that it offers the versatility of an open face helmet with the protection and safety of a full-face closed helmet. Let’s take a look at what sets Hawk’s H-66 apart from the competition. The interior liner of this helmet is a comfortable microfiber that wicks moisture away from your skin and breathes well to allow for superior ventilation and cooling even on hot days. Additionally, putting the helmet on and removing it is a much quicker process than with most helmets thanks to the modular front face mask, which flips up and away entirely thanks to the quick release switch in the chin guard and eliminates struggling in and out of your helmet after a long ride. In addition to the modular front face mask, the H-66 features a clear anti-scratch, anti-fog visor and an internal drop-down sun visor for when you are riding into the early morning or late afternoon sun. Both visors are spring loaded for quick activation while riding, and are controlled from a convenient push-buttons on the side of the helmet. The ABS Thermoplastic shell provides the protection you need to keep you safe in the event of an accident, and Hawk offers a wide range of available graphics for its helmets to allow you to customize it according to your particular aesthetic and style. In terms of ventilation, the H-66 has top and front vents to allow free airflow while riding on hot days, and rear ventilation pulls the warm air out the back to help keep your face and head cool on long rides. To provide better communication on long road trips and allow you to make and receive phone calls, enjoy streaming music from your phone or stereo, and hear navigation directions in the comfort of your own helmet, the H-66 features full Bluetooth connectivity with most compatible devices. 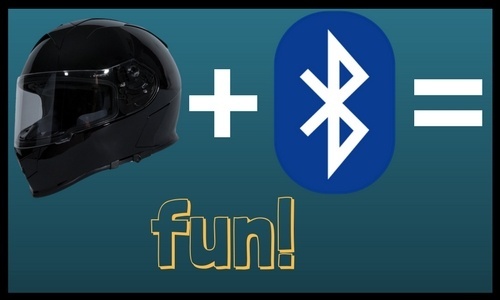 Additionally, you can also use Bluetooth for helmet to helmet intercom communication within 100 feet. Dual spring-loaded visors: clear exterior shield visor, and an internal sun visor controlled from the side of the helmet. Bluetooth connectivity for communication, navigation, and audio/music streaming. When shopping for a top-of-the-line modular motorcycle helmet with optional Bluetooth integration, you need look no further than the IV2 Model 953. This package comes with a whole lot of high end modular helmet features and a bluetooth module with helmet mic and receiver included. Here’s a breakdown about what makes this modular offering from IV2 such a fantastic value. 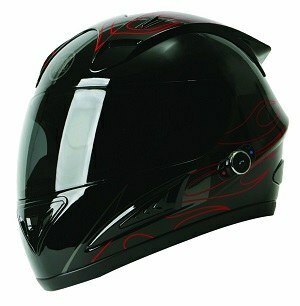 Inside, this helmet has all the comforts modern designers can offer, with an advanced EPS impact absorbent inner liner. The padding allows for a comfortable fit that most users say is very close to industry standard sizing, and the liner is both removable and machine washable for convenient long term care. The modular design also allows for a more comfortable on/off process thanks to the one-handed, push-button operation that converts the whole helmet from a closed face to an open face helmet. Not only can you flip the entire faceguard up and out of the way, but this helmet has dual visors for excellent visibility in any lighting conditions. The clear anti-fog, anti-scratch exterior shield provides protection from airborne particles and road debris, and there is an internal drop-down sun visor to eliminate glare on those early or late daytime rides. All visors are spring loaded and can be operated with one hand on the side of the helmet. The Model 953 has an advanced thermoplastic ishell that comes in a wide variety of available graphics and colors to complement your style or your ride. It also features front to back ventilation for cool comfort even on long rides on hot days with the face shield down, and allows for superior ventilation thanks to rear vents when the face shield is up. With the included SENA HM5 Bluetooth Receiver unit, this helmet supports Bluetooth connectivity 3.0 protocol and lets you direct intercom to up to four other bluetooth helmets within a 1200-foot range. It also allows for music sharing to multiple devices, and supports pairing with up to two smartphones. Best of all, the Model 953 also supports audio streaming from compatible onboard navigation systems and for music playback streaming from your ride’s Bluetooth compatible stereo. Helmet is heavier than most motorcycle helmets, weighing in at 6 pounds. As a high quality, value priced option, this helmet, you just can’t beat TORC’s T10B Prodigy in terms of included features and options. With a microfiber liner that is both removable and machine washable, there’s a lot to love about the comfortable and stylish fit of the Prodigy. Sizes tend to run a bit large though, so go with the next size down if your measurements are between sizes. A fog-free. scratch resistant visor keeps your protected from airborne particles and road debris as you ride, and it can be opened and closed using the onside controls with one hand. The ABS plastic shell of this helmet can protect you from even the most devastating of impacts while remaining in one piece, and the helmet is fully ventilated front to back at the chin guard and over the top of the helmet to keep you cool even when riding on hot days. Best of all, the vents are fully adjustable to allow you to better limit airflow during inclement weather, which is a feature even some high end helmets do not offer. Sporting their newest Blinc 2.0 Bluetooth connectivity, the T-10B has a built in rechargeable battery pack with 8 hours of talk time and 150 hours on standby. It also features two large speakers that crank out serious volume and are audible even at speeds over 60 MPH. Controls are large and glove-friendly, and are waterproof to protect your onboard audio from the elements. Best of all, it supports direct intercom with other Blinc equipped helmets within 100 foot range, and it sync seamlessly with smartphones, onboard GPS systems, and vehicle audio systems to make every ride better with music and conversation. With their longstanding reputation as one of the top helmet manufacturers, it comes as no surprise that the BILT Techno sets new standards for quality and integrated technology. This injection molded polycarbonate helmet can withstand regular impacts, and the high visibility Day Glo finish keeps you seen and not just heard when you are out on the road. Here’s a breakdown of all the best about the BILT Techno, plus a couple of considerations to factor into your buying decision. One of the best features of this helmet’s Bluetooth integration is the direct link intercom connectivity. The Techno can easily pair for two-way communication with any other Bluetooth capable helmet or intercom system without the need for an additional independent intercom system. Thanks to the DWO-3 communication system syncs seamlessly with mobile phones, allowing you to make and receive phone calls without the need to fumble for your smartphone. It also allow you to stream audio from your device, keeping your tunes audible whenever you ride. Whether your bike has a built in GPS or you have a GPS unit that pairs wirelessly, allowing you to feed audio prompts for navigation directions directly to your helmet. Obviously, using a smartphone with a navigation app works as well, but knowing that you can sync up with existing hardware that you own is definitely a value add feature. The BILT Techno meets or exceeds all US DOT standards, and has become immensely popular with safety conscious riders due to the aesthetic design, comfortable fit, and well designed external controls. I believe this model has been discontinued by the manufacturer, so maybe it isn't one of the best bluetooth helmets anymore!